It all starts with CalWin Basis, but after that you can choose the exact mix of modules for your business. Each module is listed here along with it's features. CalWin Basis is the foundation module in CalWin. The module does not depend on the other modules and may be used completely on its own. All standard functions can be carried out in Basis, as can all tasks connected with quotes, order registration, all product work, prices and calculations. There is also full freedom to print out reports and create special reports. As well as being an independent and fully usable module with rich functionality, Basis is the real brain in CalWin. 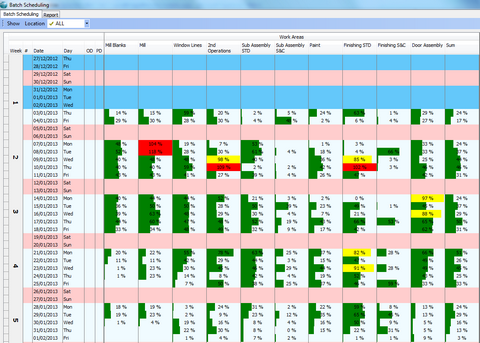 This is where all parameters applying to the whole installation are entered . CalWin Basis provides access to the underlying functionalities employed during day-to-day work using CalWin. The basic data for all products are built up here and this is where all current data on customers, terms and conditions and other relevant information are held. CalWin is developed for Oracle databases and that gives extremely good performance and scalability to even the largest multi-location enterprises. Definition of basic tables for customer, suppliers, payment terms, product definitions, items etc. 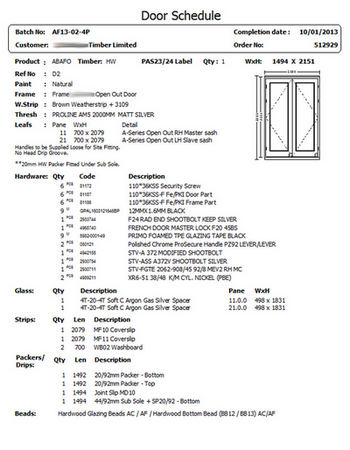 Definition of Windows and Door products with options sets, restrictions, and its composite components. Calculations. Advanced Bill of Material facility handling all the typical challenges for this industry. Wages can also be defined very precisely on a per work area basis. Very flexible and efficient user interface, with per user customization possibilities. 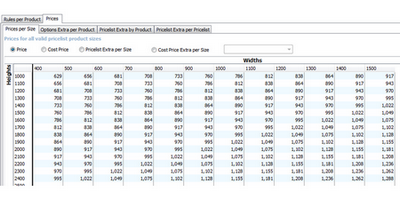 Quotation with calculated prices (Price List is an optional module). 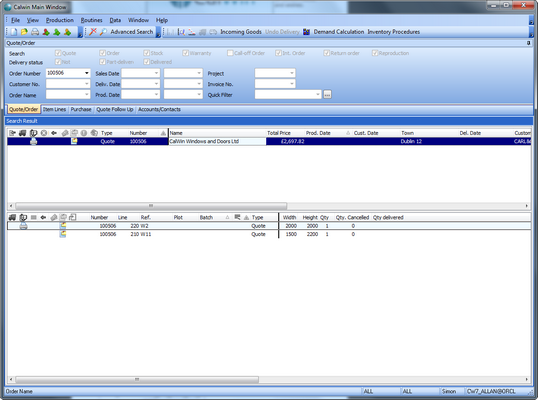 Converting quotes into orders with a simplified production calendar. Flexible and powerful searching for quotes and orders. 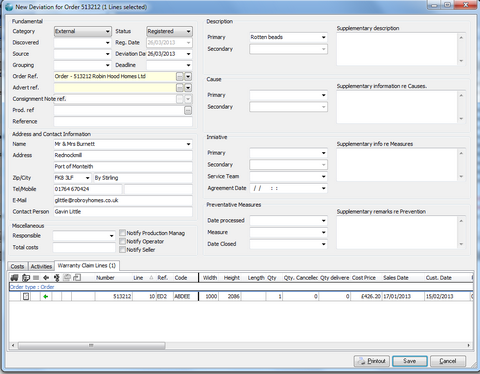 Easy re-calculation of costing and pricing when changing an option at quote/order level. An open architecture for EDI messages to and from CalWin based on XML. All data that can be delivered or consumed electronically is well defined in XML schema, and CalWin can map to any desired format. Possible with advanced customization of business logic via a script language. Using CalWin Basis as the starting point, a comprehensive collection of modules can be put together in a CalWin solution that fully covers all current needs and wishes. CalWin Sales and Customer Follow-up is the CRM element which has everything necessary to undertake professional and regular follow-up of quotes, orders, projects and customers. You have full oversight over all documents linked to quotes, orders, outgoing invoices, projects and customers. If desired, it can also cover incoming documents. CalWin Sales and Customer Follow-up may also be integrated with Outlook. CalWin Sales and Customer Follow-up may also be used to send out letters to a selection of customers. Keywords and other criteria may be used to make flexible choices. All mailings and activities are stored for subsequent follow-up. CalWin Sales and Customer Follow-up does not aspire to be anything other than it is, so it only has the functions that most organisations need to administer and follow up their sales and marketing activity. Notification when logging in of quotes that has passed their follow-up date, and needs attention. 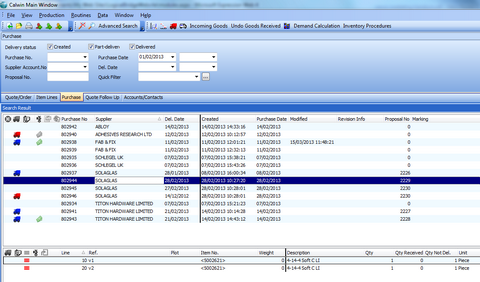 Logging and access to all documents in CalWin linked to quotes, orders, invoices, activities etc. CalWin Word Quotes makes it possible to send an ordinary CalWin quote to a dealer in ordinary Word format. The dealer can open the quote in Word and can adjust prices with mark-ups and discounts, so that the dealer’s price and the total amount of the quote replace the manufacturer’s price. The quote to the end customer is printed out with the dealer’s logo, so that the manufacturer’s name does not necessarily appear. 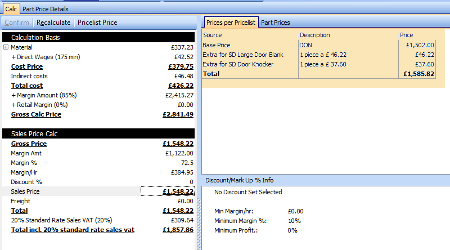 Once the mark-up and discounts have been registered, the document is converted into a standard Word document that can then be edited with additional information including new product lines from the dealer’s own range. It is a very simple and effective aid for facilitating and furthering cooperation between the manufacturer and the dealer. No program other than the almost universal Word is required and there are no special knowledge requirements. So getting started is quick, simple and cheap. CalWin Word Quote can make the sales work more efficient both for the manufacturer and the dealer, thus enhancing sales prospects. CalWin Price List is a valuable supplement to the calculation function in CalWin. Several price lists may be built up in this module for different requirements, e.g. customers and groups of customers. Consequently it can be operated using different prices for different markets and to different customers, without much manual work and follow up being required. There are no restrictions on the number of different price lists that can be set up. The price lists may be linked to all types of products and are used by CalWin during entering of item lines, when quotes or orders are being registered. When the product in the item line corresponds to a price list product, the price is retrieved from the price list. For other products the price is drawn from the calculation. CalWin Price List simplifies pricing, so it also makes the work involved in registering quotes and orders easier. Price setting takes place automatically and efficiently; simultaneously the pricing of new products can be evaluated and adapted individually using CalWin's calculation function. 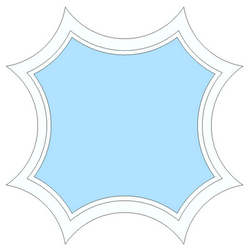 At all times an overview is provided of the real margin on the product or the whole order. In this way the firm’s earnings may be influenced continually through sure and effective management of list prices and flexible and tailored pricing for other products. 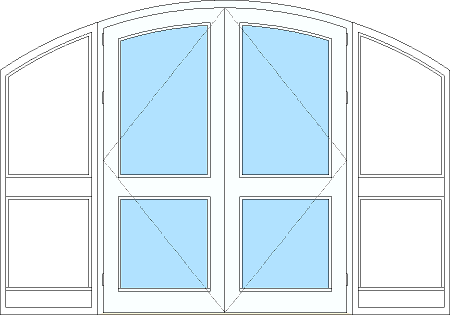 CalWin Round and Arched Windows - with this module there are no restrictions on the geometric shapes of windows, doors and profiled recesses in doors that can be constructed using CalWin. Regardless of whether products with round and arched shapes are selfproduced, or whether these products are bought in	from others,	they can be	registered in CalWin and	thus go	onto the relevant document with a drawing and specifications, like any other product. CalWin Purchasing controls your purchasing as much as your sales. It can either be used as an independent purchasing module, in which purchase orders are registered manually, or in combination with CalWin Requirement Calculation, which can create purchasing suggestions in the purchasing module. The module may also be used in combination with CalWin EDI Purchase, for electronic communication with suppliers, and with CalWin Purchase Invoice. 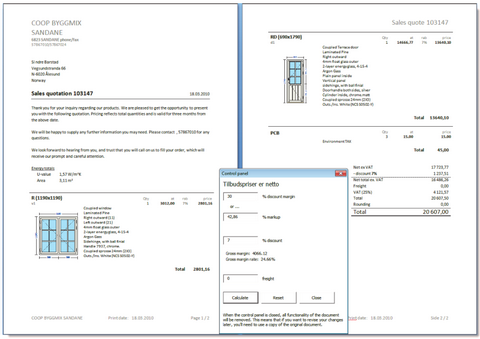 In addition to purchasing traditional items, CalWin’s Purchasing module can handle configured product like window, door, glass, fittings with specifications etc. 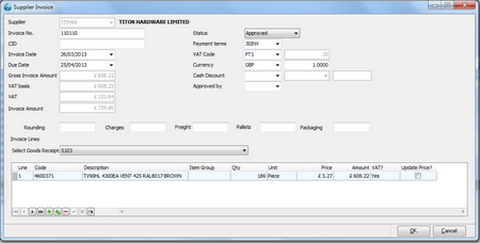 CalWin Purchasing can be used in conjunction	with the EDI Purchase and Invoice Receipt modules. The purchase order is created by CalWin as a file which as well as ensuring rapid despatch and receipt, saves work and time at several points in the chain. This also provides maximum security against errors. CalWin Electronic Purchasing uses the EDI (Electronic Data Interchange) architecture in CalWin and therefore is total open for any required data format. This brings electronic invoicing to all in the industry who require it, right now. If new formats are needed, it is easy to adapt and can be done outside CalWin by standard off the shelf software systems (XML mapping). CalWin EDI Purchasing requires CalWin Purchasing to be installed. CalWin Purchase Invoice contains the functions for receiving and checking incoming invoices that apply to purchases that have been generated or recorded in CalWin. We also find here the routines for allocating accounting references and transferring invoice information to an external accounting system. The functions in the module contribute to more secure checking of invoices against items received as well as providing a good facility for re-use of the information later on. The accounting work is carried out in the Purchase Invoice module, with consequent rapid updating of postings and the amounts of transactions in the financial system afterwards. CalWin Purchase Invoice requires CalWin Purchasing to be installed. CalWin Stock Management records all movements to and from stock, and maintains quantities in stock for every item. 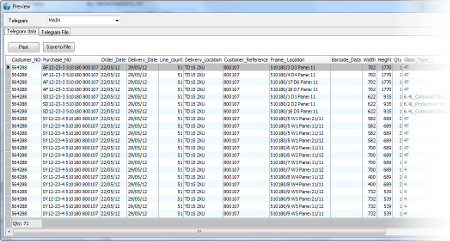 It also tracks live information about quantities on order and in production or purchase. All this on an unlimited number of stock locations. CalWin Stock Management includes a very easy to use, but advanced stocktaking facility. It has support for an unlimited number of stocktaking areas. So you can stock take the same item at several areas. In addition to handling normal items (raw materials), this module opens for stock holding of constructed products— windows and doors. So when a operator enters a product that match a defined stocked product, he will be notified and given the option to either pick it from the stock or produce it. Overview of stock, balances, incoming and outgoing. 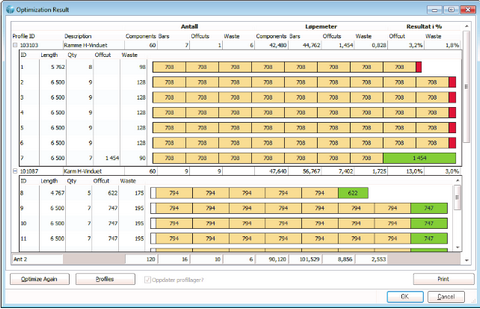 CalWin Requirement Calculation module enables automatic calculation of the requirement for raw materials, semi-finished items and finished products. Timely ordering of required items is assured using CalWin Requirement Calculation, and production goes as planned, because the necessary raw materials and other merchandises are always in place when required. Because it is CalWin that monitors the Requirement for items, purchases may be limited to those items that will be used within a short time. So the stock balance is optimised, which in turn means reduced storage space and less tied-up capital. When CalWin Requirement Calculation is used in combination with the stock and purchasing modules, a complete stock and purchasing function is achieved that ensures good oversight and minimal and cost effective stocks. CalWin semi-finished items has functions for managing production and stocks of components that are to go into one or several finished products. The module provides an overview of semi-finished items in stock, thus providing the basis for purchasing or producing such items. This contributes to optimised production of finished items and to shorter delivery times. 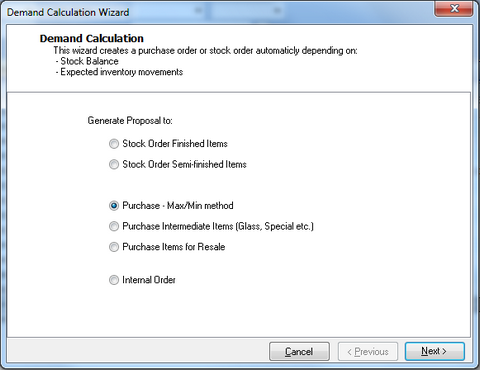 Used in combination with the CalWin Stock Management module it provides a complete view of the entire stock balance, what has been reserved for orders in hand, what has been ordered, when the items will arrive in stock and how many semi-finished items are in stock or in production. CalWin Semi-Finished Items is very flexible and its setup and use may be adapted to meet varying demands and wishes. CalWin Production is a powerful and flexible tool that enables functional planning and execution of all production in the firm. CalWin Production utilises all data such as products, orders, raw materials etc. and other current information found in CalWin, and forms the basis for efficient and optimal production. Every installation (all setups) can be adapted to various requirements and wishes and the production plan can be adapted in a very flexible way to existing staff levels and production equipment. CalWin Production utilises and combines all current data quickly, efficiently and securely. This saves the manufacturer a significant amount of manual work. Shorter throughput time and better utilisation of capacity can be achieved, and precision of delivery is improved. CalWin Capacity gives full overview of the production and delivery capacity in the firm. Having this tool in place provides full control over capacity and work load at selected production points in the factory. CalWin Capacity makes it possible to utilise capacity to the full. This increases earnings and achieves the shortest possible delivery time. 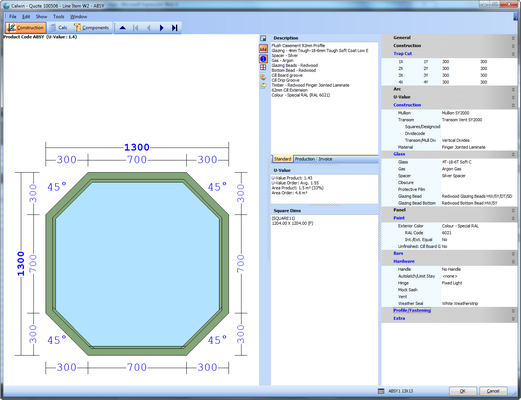 The capacity module in CalWin is the most important production planning tool. Active use of the facilities provided to utilise production capacity can have a direct effect on the earnings of the whole firm. CalWin Checkpoint enables you to check and follow up on production at an unlimited number of checkpoints in the factory. Basically it’s a Online Production system that can replace paper. Acknowledgement at the checkpoint may be done automatically using bar codes or RFID, or by PC-based manual registration at each checkpoint. An internal message can be passed from one checkpoint to the next, about current conditions that are important for production or for the product. Important messages to production can also be entered by operator at item line level. With CalWin Checkpoint you gain a rapid overview of the progress of production and it is easy to give precise answers to telephone enquiries, without having to involve other employees and without having to go through the production areas to locate the product or order in question. CalWin Checkpoint saves time, contributes to production being overseen better and leads to better service to customers. CalWin Checkpoint is very flexible and can be adapted to your methods, so that its utility value is optimised in each individual case. You can define as many or as few checkpoint areas as you need. CalWin Machine Link takes care of the transfer of all necessary production information to the firm's production machines. CalWin contains all the data required to be able to produce any product that has been entered. These data can be processed, sorted and specially adapted for any production machine delivered by any recognised manufacturer or supplier. Modern production machines have their own advanced control systems that instruct and govern the machines. CalWin Machine Link is the connecting link that can communicate with all types of production machines for window and door production. CalWin Machine Link is flexible and support a broad range of formats and machinery. Define and develop unlimited number of Machine Link projects. 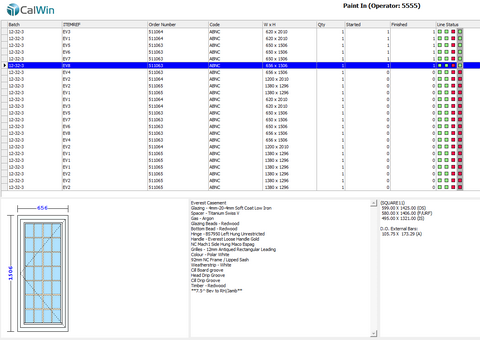 Execute Machine Link projects from production batches or specific orders. Optionally Machine Link projects may be run integrated with the machinery via CalWin Server. Flexible SQL based data/part retrieval and mapping to defined telegram. Script language for advanced data manipulation and calculation. File output to any defined location supported by the OS, or delivery as attachment in an e-mail. Output to multiple destinations and formats simultaneously. ASCII: Fixed length and delimited. Use of CalWin Machine Link requires CalWin Production to be installed and in use. CalWin Bar-Optimisation provides for maximum utilisation of length-based raw materials by optimising cutting. CalWin Bar-Optimisation does this planning the cutting sequence of components on bars to minimum possible waste. The module provides for offcuts of more than a certain length being marked and stored for future use. CalWin BarOptimisation remembers these pieces next time and suggests them when they can be utilised efficiently. CalWin Bar-Optimisation reduces waste during production to the absolute minimum and thereby contributes to better financial outcomes! RFID (Radio-frequency identification) is an incredibly powerful emerging technology in this industry, and CalWin supports both reading and writing of RFID tags. The reading and writing process is handled by a third party software called CrossTalk from noFilis (see http:// www.nofilis.de/). CalWin integrates seamlessly with CrossTalk. That means that a checkpoint screen can receive RFID readings and act accordingly. For example by displaying the right product and even sign the checkpoint as started or finished. 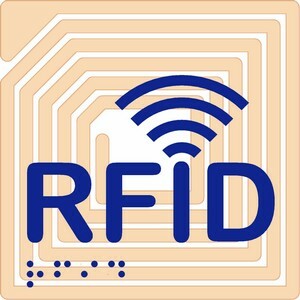 Normally a RFID tag will contain a serialnumber, and then CalWin will ensure that a RFID tags never will be signed twice. This is a advantage compared to barcodes. CalWin Consignment Note simplifies and automates paper-based shipment routines and makes them more efficient. Current data in connection with shipment are transferred direct from CalWin to the carrier. 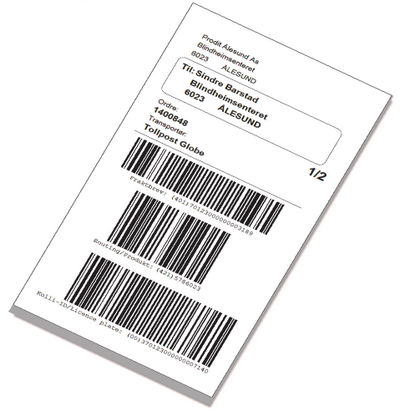 If printed consignment notes are wanted, these can be produced automatically. Consequently all manual work is avoided, the process is quick and the risk of error is eliminated. The customer receives direct notice of shipment by email can keep himself updated on transport and arrival time by accessing the tracking information. CalWin Deviation Management is a flexible tool for recording all forms of deviation/rework in production and administration. Deviations may arise in any organization, manufacturing process, procedure or routine. Some deviations do not necessarily have significant consequences, while others may lead to large losses or inconvenience in the form of delays and financial loss. Frequent large deviations can be very expensive and it is therefore important to prevent them from happening. The deviation module can to a large extent be adapted to individual wishes and needs. It can carry out dependable and effective recording of deviations, which in turn can also contribute to improvements and efficiency gains. When entered, a deviation record may include the reason, plus suggestions for measures to prevent the deviation happening again. 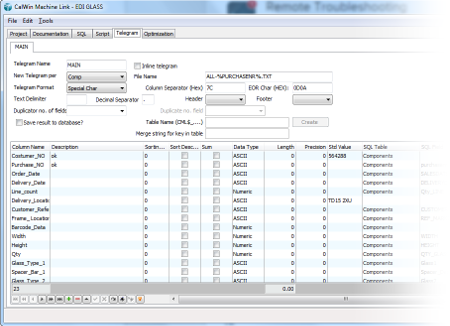 Systematic recording and follow up of deviations avoids delay for both the manufacturer and customers. The manufacturer can make great savings and avoid large	extra costs	by systematically recording deviations. Better and more professional customer service is achieved at the same time. CalWin Invoicing is a complete invoicing module and has all the functions and facilities expected of a class-leading invoicing solution. Because the basis for invoicing is already present in CalWin, the result is a particularly efficient, labour-saving and secure invoicing package. The module has all the necessary functionality to cover all invoicing and credit note eventualities, such as ordinary invoicing of items delivered, partial invoicing, on account invoicing, group invoicing etc. As well as being linked to a customer, all invoices may also be linked to projects or groups of companies. They are easily accessible for future reference, for use by the sales department and for formal follow up. 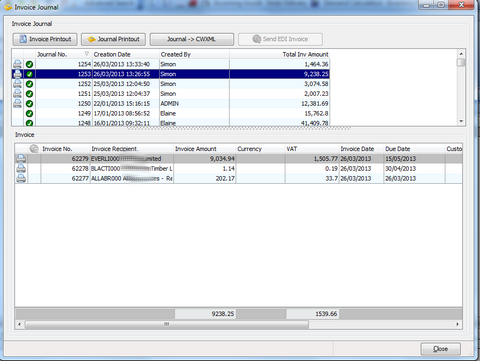 The CalWin Invoicing module is capable of replacing other invoicing systems. When invoicing is carried out in CalWin, which already contains all the background information, the need for corresponding functionality in the accounting system is reduced and most CalWin customers are able to use a simpler and cheaper financial system than would otherwise have been necessary. CalWin Electronic Invoicing delivers direct electronic invoices into your customers computer system. 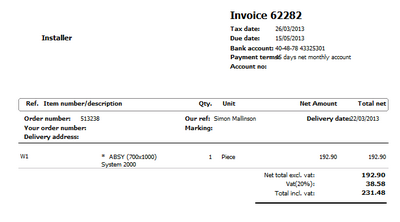 More and more of our customers have received requests to send their invoices electronically to their customers. The invoice is delivered electronically directly, or via third party message partner, to the recipient’s purchase or ERP system. This avoids potentially costly manual procedures. This module uses the EDI architecture in CalWin and therefore is total open for any required data format. This brings electronic invoicing to all in the industry who require it, right now. If new formats are needed, it is easy to adapt and can be done outside CalWin by standard off the shelf software systems (XML mapping). CalWin Server is a set of software services available from CalWin meaning you can develop your own solutions which link directly to CalWin. This avoids the headache of having to maintain data in two or more places. Some examples are time and attendance systems, machine breakdown logs. Even CalWin webshop was developed using CalWin server. 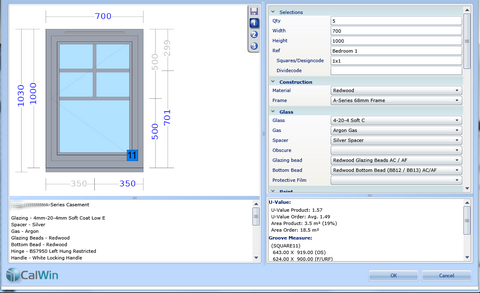 CalWin Webshop allows remote users to configure windows via the web. 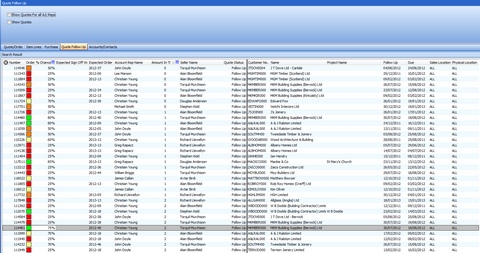 You can set the options available per company / user so this is perfect for installers, agents or retailers. They can set their own margins and print quotes for their customers. The quotes are created live so there is no need to transfer data or double-input. Best of all you can create new sales at a minimal overhead. CalWin Multi-Location is a unique solution for businesses with several locations for production, stocks or sales. Whether everything takes place within one legal entity or whether there are various legal entities. CalWin is therefore just as suitable for the very biggest manufacturers with many units and users, as it is for smaller, stand-alone factories with a few users. As many locations as required may be used. 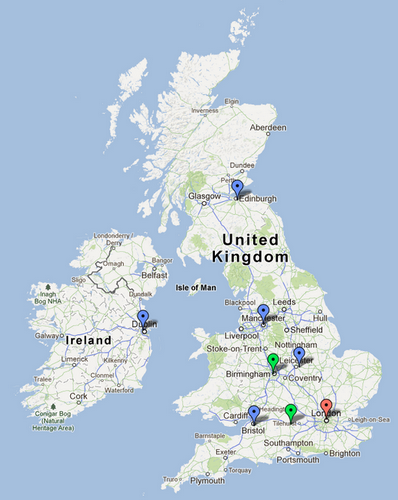 The system can be set up with different functionality for each location. An order may consist of items that are produced at several locations, with automatic internal invoicing between them. Shipment may go to the customer direct from the manufacturing unit concerned, or the items may be collected in one place for simultaneous shipping of all order lines. Each location has its own numerical series for quotes, orders, invoices, purchases etc. As a starting point, the various locations do not “see” quotes, orders and purchases from other locations, but there is substantial flexibility in the setup here as well. CalWin Multi-Location is a very advanced solution, which takes care of all data flows between the units, provides for maximum utilisation of all spare production capacity, administers shipping and monitors all inter -company financial affairs between the units. The firm’s management receives all relevant information from a single system, which facilitates speedy and correct decision-making. There are no limits to the number of locations or the number of users in such a solution. The Oracle database that underpins the solution ensures quick and secure handling and storage of all data. CalWin Multi-Location replaces solutions that normally have to be assembled by combining several partial solutions. By drawing all important business operations together in a single solution, time spent on operation and data exchange is saved, central information is concentrated in one place and the system handles all data traffic seamlessly without the need for integration solutions and data exchange. With CalWin Language all outgoing information can be written in an additional language, so that customers in other countries receive quotes, order confirmations, invoices etc in their own language. CalWin can be delivered with various basic languages: English in English-speaking countries, Norwegian in Norway, Swedish in Sweden. All prompts and command line texts in screens, standard reports and system messages will be shown in the basic language. This module is necessary for all those who work with customers in other countries, and it makes it possible for all customers, regardless of which country they are from, to receive all documents from CalWin in their own language.